we offer to climb the one of the mose Chhanange peak Mt. 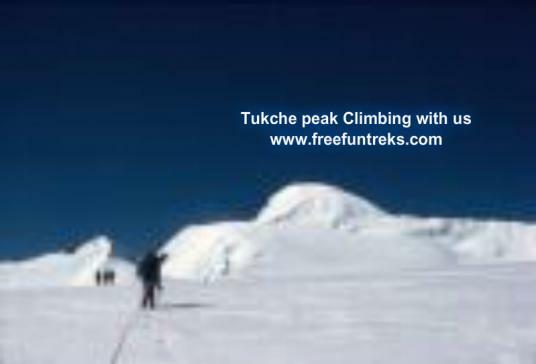 Tukche is a spectacular peak situated in front of Dhaulagiri 1 and the Annapurna range. Tukuche was first climbed by a Swiss team in 1969. Due to its remote location and the seriousness of the terrain, the area is seldom visited by commercial trekking groups. As far as risk factor is concerned, the expedition to Tukche Peak is regarded as ‘low risk’. Our summit attempt for Tukche Peak begins once we reach Hidden Valley BC. Having set up Base Camp we will begin pushing out the route and acclimatizing. Once the climbing phase is, over we will descend to Jomsom for a flight out to Pokhara and then on to Kathmandu. this peak is very much teachinical and quite challanceing even the Mt Everest. · An experienced, helpful and friendly Government license holder trekking Guide. · Three time meal during the trekking Breakfast, Lunch & Dinner. · Insurance for Nepalese staff. · Guide and porter fares and taxes.Government Tax and office service charge. Nepal entry visa fee US$ 40 (duration 60 days from date of issue)- you may easily issue the visa upon your arrival at Tribhuwan International Airport -Kathmandu.